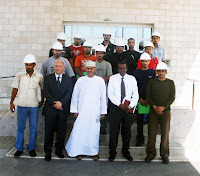 Muscat, Oman, March 25, 2009: Octal Petrochemicals has received the first class of graduates from the technical training course it developed in partnership with the Salalah College of Technology. The one-year Polymer Manufacturing course involves four months of classroom study followed by an eight-month work placement at Octal’s state-of-the-art facility in the Salalah Free Zone. Octal employs more than 270 people at its integrated PET resin and sheet facility in Salalah, and hopes to offer full-time positions to the best candidates at the end of each successful induction. Having completed classroom study and coursework in polymers chemistry, instrumentation, electrical and mechanical operating systems, and engineering terminology, the first group of 13 trainees will now undergo eight months of work experience at Octal’s PET resin and sheet-making plants. The on-the-job training covers the critical areas of Octal’s advanced manufacturing processes, including PET res in production and PET sheet lines operations, Utilities Operations and Maintenance, instrumentation and control maintenance, warehousing and logistics. A total of 43 students are enrolled on the Salalah College of Technology Polymers Manaufacturing course, and the second batch of students will begin work experience at Octal in June. Octal trainee Jamal bin Mohammed Al Balushi said he was happy to have been selected for the course and was enjoying the opportunity to gain work experience at Octal in the PET sheet quality control section. Oman-based Octal announced the launch of its second plant, a 300,000 metric ton integrated PET resin and sheet facility, in January. Octal expects per annum sales to reach US$400 million by the end of 2009, and despite the global economic downturn remains in expansion mode with plans to hire 100 extra staff before the end of the year.